Everything you need to know about the opera many consider Verdi’s masterpiece. Giuseppe Verdi had a gift for taking a character marginalised by society and putting them centre stage – whether it be a hunch-backed jester in Rigoletto, an Ethiopian princess in Aida or a courtesan in La Traviata. He wrote big, beautiful melodies that demanded technical brilliance from his singers – but are also undeniably catchy. The composer was born in a small village in Parma to a poor family. He became a music teacher and conductor before finding success as an opera composer. By the time he died in 1901, his fame was such that 28,000 people lined the streets at his funeral to pay their tribute. The Duke of Mantua lives only for pleasure of the female kind. No man’s wife or daughter is out of his reach, and while the Duke seduces their women, Rigoletto mocks their misfortune. The men of the court want vengeance, and when they hear Rigoletto has a beautiful woman hidden away, they plot to abduct her. The woman is Rigoletto’s daughter, who despite his best efforts to keep her hidden, has already caught the eye of the lustful Duke. He pays a visit to seduce the beautiful Gilda. Before he can complete his mission, Gilda is kidnapped by the mob of men, who take her to the Duke’s palace for his amusement. The distraught Rigoletto vows to take vengeance. But Gilda loves the Duke, in spite of everything, and is prepared to go to any lengths to save him from her father’s wrath. Love and vengeance meet in the darkness as the opera draws to its dramatic, devastating conclusion. La donna è mobile. Verdi knew he’d written a bona fide hit – he only gave the tenor the music a few days before the opening, and forbade him from even whistling it in public, lest one of his competitors steal it and pass it off as their own. Um. Everywhere. From advertising to movies to anything you can put your finger on, this has got to be the catchiest tune in opera. Each of their characters has their own “theme music” – a rhythmic or harmonic pattern that signifies their entrance into the action. The Duke’s music is jaunty, charming and catchy and the beautiful Gilda has beautiful melodies. The assassin’s own orchestration is appropriately menacing. In the last act, as a storm brews over Mantua, Verdi captures the change in weather perfectly in the orchestra: rumbling thunder from the low strings, lighting from the high wind instruments and thrashing winds from the quivering strings. With a sleek dark set and glamourous period costumes, this production takes you right back to the narrow streets of Mantua and the danger and promise they held. Directed by Roger Hodgman and designed by Richard Roberts and Tracy Grant Lord, the production is rich and thrilling. A prolific opera composer, Verdi was always on the lookout for a strong character to base his next work on, and when he read Victor Hugo’s play Le Roi s’Amuse, he was captivated. The story of a lascivious King and his hunchbacked jester was banned in France after just one performance, but it was in the jester Verdi saw “a creation worthy of Shakespeare”. He knew it would be a battle to get through Austrian and Italian censors, so at the suggestion of one of the very censors he needed to satisfy, swapped the King for a Duke, the setting from France to Italy and toned down some of the action. 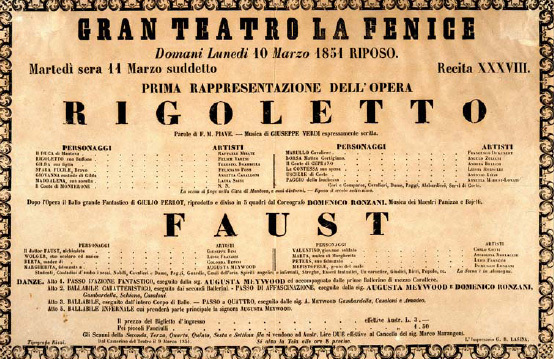 It went back and forth with the authorities for months before it opened, but when it did premiere at La Fenice in Venice in 1851, it was a triumph. The opera is now widely considered Verdi’s masterpiece. The opera was a triumph at its 1851 premiere, and is widely considered his masterpiece. A few trivia tidbits in case you get stuck for a topic in the queue to the bathroom. Verdi wrote most of the score over a period of 40 days. Rigoletto is on at Arts Centre Melbourne: April 12 – May 10, 2014 and the Sydney Opera House: June 26 – August 24, 2014. Our absolute favorie Duke is the great Tenor, Gianluca Terranova who is singing this role in Melbourne!! He is magic!! Emotionsful, charismatic, with a voice you must fall in love with!! The whole production is amazing! Would like to see more videos in YouTube, thanks a lot in advace! !